Tuke is a turtle that lives in the Caribbean reef and is constantly ridiculed for being undersized for his large shell. After the teasing gets to him, Tuke travels away from the reef and meets some researchers for Central Caribbean Marine Institute. After meeting the group, Tuke believes he is special and tries to show the underwater world how special and important he actually is. 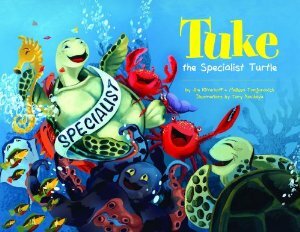 Children can relate to Tuke’s story and the desire to be “special.” Learning about Caribbean reefs and the fish that inhabit those areas are an obvious added bonus. The illustrations are beautiful and transport the reader to a colorful underwater world. Although it is a picture book, the many pages and occasional big words might be too much to keep a younger child interested for the whole thing. That shouldn’t deter anyone from picking up this book though. I have always believed that a child’s vocabulary can be challenged at an early age. My age suggestion is 5 and up.